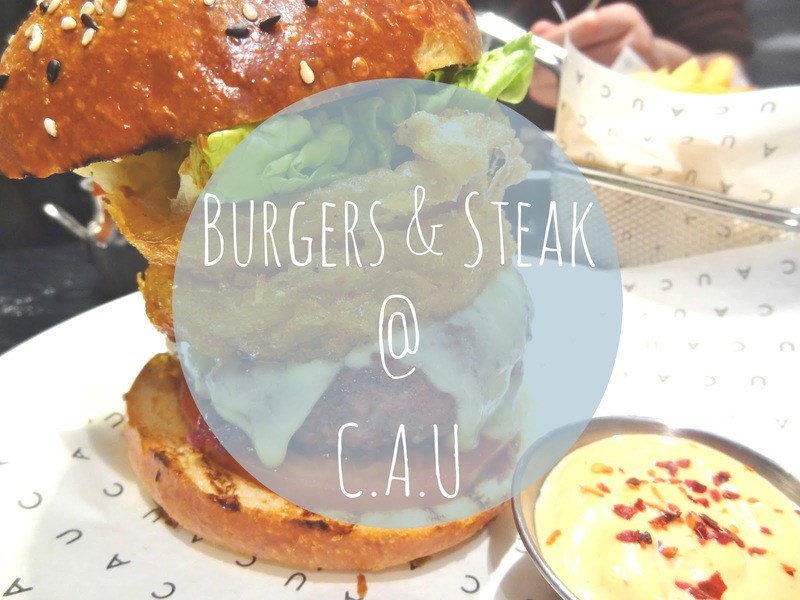 CAU (pronounced like 'cow' and standing for Carne Argentina Unica) boasts a menu embracing Buenos Aires cuisine, they, quelle surprise, do fabulous beef and good Argentinian Malbecs. If you live in, or are visiting, Berkshire, and like to chow down on some prime meat, you need to get yo-selves down to this restaurant. First up, Argentinian flatbread. Seriously good flaky dough with sweet onion, milky mozzarella and fresh oregano. Washed down with a Cau Cooler, raspberry, apple, passion and grape on ice. For mains, a huge hunk of prime rib eye steak and the deceptively simple sounding 'BBQ Burger'. Let's talk about the burger first..
Toasted brioche bun base, smothered with home made BBQ sauce (not too sweet), topped with tomato, sweet onion marmalade, the most juicy mid-rare patty made with premium Argentinian sirloin and ribeye steak, Montgomery cheese, the lightest, crispiest, fresh onion rings, crisp baby gem, more of the delicious BBQ sauce and the sesame-sprinkled other half of the bun. All superlatives necessary. To. Die. For. Ribeye. 30+ day wet-aged, vacuum packed for freshness and shipped from Argentina's own shores, this delicious hunk of meat tasted so sweet and meaty and flavourful, cooked over flames, you need to try it. Triple cooked fries. Seasoned, crisp, fluffy perfection. Roasted mushrooms with aji molido (crushed peppers to you and I), garlic and spring onion. Meaty, intensely savoury and full of umami goodness. Finished off with churros and dulce de leche. Freshly fried donut-like sticks rolled in cinnamon and sugar, what's not to like! And their staff wear cute tshirts. And oh yeah, they do brunch. No further words needed. Cancel all plans and book a table. I just got sooooo hungry reading this post! The BBQ burger looks absolutely immense!